It has a very bitter taste so is usually for external uses. Often used to produce an incense to banish negative energy, evil spirits and demons. In Tarot it is used to learn the mysteries of the devil card. Also known as the food of the gods it can be used to invoke male gods, particularly of a phallic nature. Can be used to gain insight and to enhance magical work in any ritual. 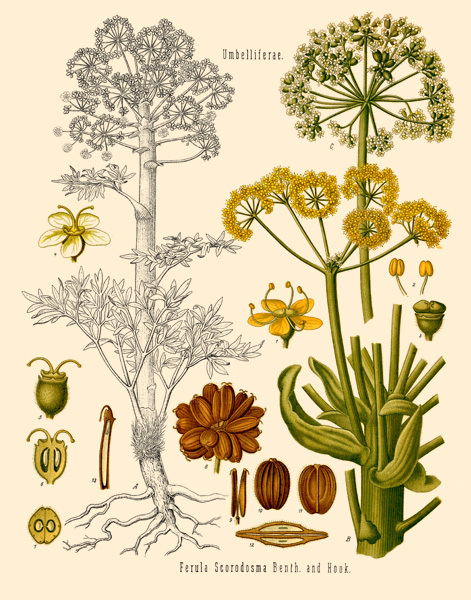 Asafoetida is a dried, resinous gum obtained from the stems and rhizomes or taproots of three species of the Ferula (giant fennel) plant. Although available in 'tears' and 'lumps', it is most commonly found in powdered form. When solid asafoetida is crushed, the sulphur compounds in the volatile oil are released, giving it a strong, unpleasant smell, reminiscent of pickled garlic. Asafoetida has a very strong, pungent smell and the flavour mellows as it is fried in oil. When cooked, it has a truffle-like flavour and a roasted garlic aroma. A word of warning however: asafoetida should only be used sparingly in any cooked dish where garlic would be appropriate even a tiny amount enhances the flavour of a dish or spice mix.